On Tuesday, the Federal Commission on School Safety released its report on how to prevent, mitigate, and recover from acts of violence in schools. President Trump established the commission in March, following the horrific shooting at Marjory Stoneman Douglas High School in Parkland, Florida. While the commission’s purported mission was to improve student safety amid a series of school shootings around the country, the commission’s most substantive action was to rescind a 2014 “Dear Colleague Letter” (DCL) from the Obama administration that sought to address racial disparities in student discipline. School suspension and expulsion rates differ sharply across racial and ethnic groups in United States, and many voices in education have raised concerns about harsh discipline practices toward students of color and their long-term effects. In essence, the DCL: (a) outlined federal law related to discrimination in student discipline; (b) described the investigative and enforcement authority of the departments of Education and Justice; and (c) gave recommendations on issues such as trainings for school staff, data collection, and alternative approaches to student discipline. The relationship between school shootings and the DCL struck many in the education community as tenuous at best—with the report seeming like an opportunistic way to rescind a letter that has long bothered conservatives. In this post, we examine that relationship and what rescinding the letter means for addressing discipline disparities. A link between school shootings and the Obama discipline guidance? Chapter 8 of the commission’s report focuses on the DCL. It critiques the letter on legal grounds (e.g., its application of disparate impact legal theory) and principle (e.g., saying that it “offends basic principles of federalism and the need to preserve state and local control over education”). These critiques make for important topics of debate—for example, scholars have argued that the federal government’s primary role in education is to protect civil rights—but are tangential to the question of what this guidance has to do with school shootings. While the report does not explicitly make this connection, Sen. Marco Rubio and others have suggested that the DCL played a role in the Parkland shooting, as the shooter was apparently served poorly, if at all, by a Broward County program intended to decriminalize student misbehavior. In fact, relative to other acts of violence in schools, homicides in schools are an outlier in that most homicides occur in schools that are majority-white. To explore this, we collected data on violent incidents in schools as reported in the Civil Rights Data Collection (CRDC). The CRDC reports on schools’ responses to questions about the types of incidents that occurred on their campuses during the 2015-16 school year. The dataset contains information about school demographics, which enables users to examine the relationship between school demographics and the incidence of violent events in schools. 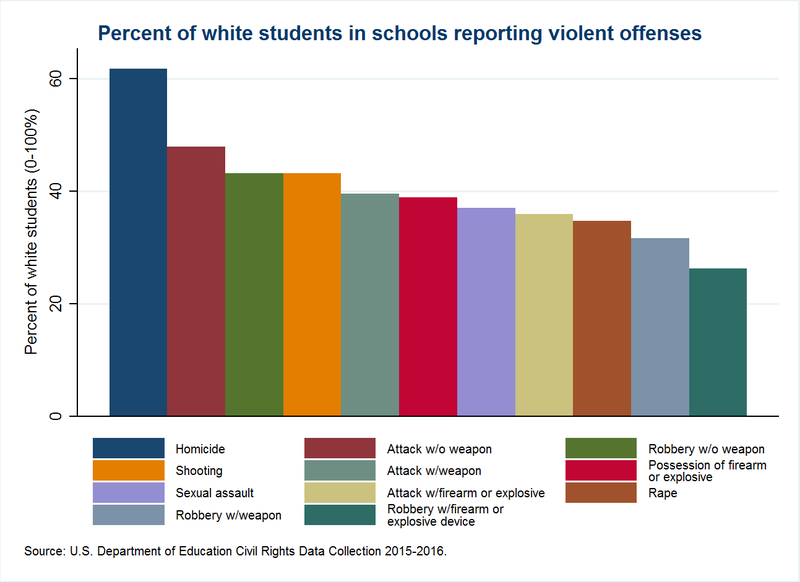 In general, the concentration of white students in the schools where these violent offenses occur hovers around 40 percent. The most notable outlier is homicides. On average, these schools are 62 percent white. At schools where shootings took place (regardless of injury), schools were an average of 43 percent white. The commission’s rationale for rescinding the DCL might be that schools have made across-the-board changes to their discipline practices that have left them vulnerable to more shootings and homicides. However, it bears noting that school shooters are not predominantly students of color, and that schools’ efforts to eliminate racial disparities in their suspension and expulsion rates do not have immediately clear implications for the occurrence of school homicides. The rescission of the DCL is a setback for efforts to eliminate discipline disparities and stem the “school-to-prison pipeline”—one that too quickly ushers kids into the criminal justice system and too reluctantly addresses the causes of student misbehavior. However, we should be clear on how, and to what extent, it is a setback. Nothing in the commission’s report prevents school and district leaders from working to address discipline disparities that concern them. Nothing prohibits the use of alternate forms of student discipline intended to be more restorative and less exclusionary than suspension and expulsion. (In fact, the report was generally supportive of the idea of Positive Behavioral Interventions and Supports.) The federal government still has a responsibility to enforce civil rights law, and students, parents, and school officials still have avenues available to them if they suspect discriminatory treatment. What has been lost, through this report and other Trump administration decisions, is a sense that the federal government fully appreciates its role in protecting students’ civil rights and is committed to preventing violations of those rights. While the report laments that school and district leaders are worrying about discipline disparities and possible federal intervention, one can take the opposite view—that the DCL drew attention to an important issue, and that making people in schools aware of the consequences of violating federal law isn’t necessarily a bad thing. Finally, we would be remiss not to state the obvious about this report: that seeing a federal report about how to prevent school shootings that is virtually silent on the topic of guns is sobering. However the DCL might have contributed to the incidence of school shootings—a connection the report fails to make persuasively—it is hard to digest that a report like this could place more emphasis on rescinding guidance on discipline disparities than addressing shortcomings in gun laws. Francesca Royal contributed to this post. Update 2/13/19: This piece initially used an older version of the CRDC report, which examined the types of violent incidents that occurred on school campuses. The figure above and the corresponding text has been updated to reflect the new data.